Hide deals from seller "Caliente Mexican Restaurant Des Plaines"
Limit 1 per person and 1 per table. Valid on Enchiladas al Gusto. Beverages not included. Dine-in only. Valid Monday-Friday from 4 p.m. to 10 p.m. Promotional value expires 60 days after purchase. Serve up a little spice with 53% off Mexican food from Caliente Mexican Restaurant in Des Plaines ($15 value). With this deal, you will get an Enchilada al Gusto dish, which includes three tortillas served with your choice of shredded chicken, ground beef or cheese. The enchiladas are topped with sour cream, Añejo cheese and your choice of ranchero, adobo or mole sauce. In business for five years, Caliente serves authentic Mexican food made with fresh ingredients and traditional family recipes. The decor showcases the rich culture, which will add to your experience. There are new creations and flavors on the menu each day that will make you feel like you're having a meal in Guadalajara, Mexico. 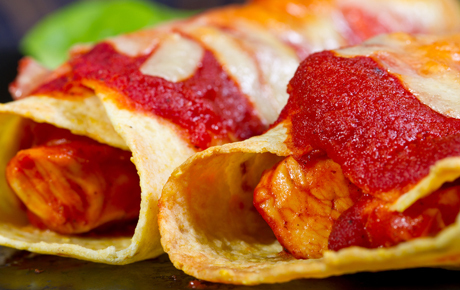 Have an authentic experience with delicious enchiladas at Caliente Mexican Restaurant. A restaurant in Des Plaines that serves authentic Mexican cuisine.